Are you in the United States? Visit our U.S.A. & International site for relevant pricing, distribution and product availability information. Boost your system performance by enhancing the capacity, speed and security of your data storage. 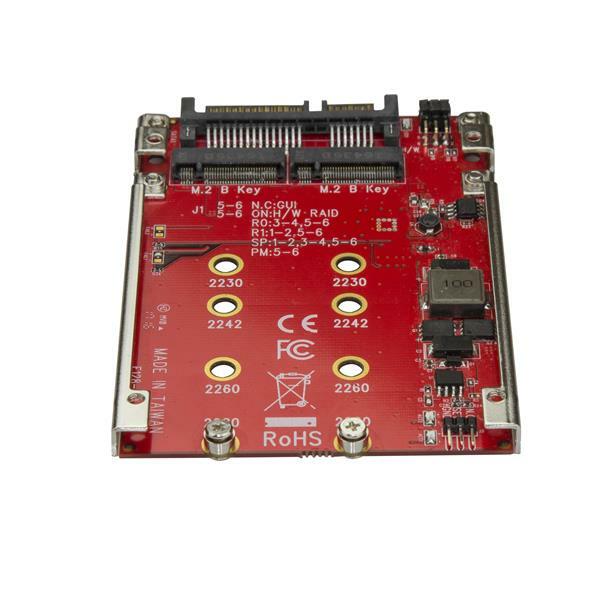 This two-drive M.2 to SATA adapter lets you install two M.2 SATA drives instead of a SATA platter drive, in a single 2.5” drive bay, and increase your storage options by configuring a powerful RAID array. The dual M.2 to SATA adapter supports multiple RAID modes, including RAID 0, 1, or spanning, helping you to achieve greater SSD capacity or data redundancy, depending on your selected RAID mode. The SSD adapter also supports non-RAID operation (JBOD) when paired with a port-multiplying SATA controller, so both drives can be used independently of one another. 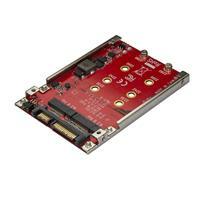 The M.2 SATA SSD adapter lets you utilize the full potential of your SATA III controller. Using M.2 SATA SSDs in place of a platter drive reduces your data transfer bottlenecks, giving you file transfer speeds of up to 6Gbps. The M.2 NGFF SATA RAID adapter also provides TRIM support to enhance the stability and performance of your M.2 NGFF SSDs. This open-frame adapter is easy to install as it comes with all the necessary installation hardware and doesn’t require any extra software or drivers, to get you up and running quickly. The S322M225R is backed by a StarTech.com 2-year warranty and free lifetime technical support. In order to see multiple drives in JBOD mode, your computer’s SATA controller must also support Port Multiplier. No additional drivers or software required. Latching SATA connectors, for securely fastened hard drive installations. This high quality SATA cable is designed for connecting SATA drives even in tight spaces. Power two SATA drives from a single LP4 power supply connector. How can I tell which M.2 hard drives will work in this device? Although M.2 SSDs come in similar form factors, only an M.2 SATA drive with an NGFF B key will operate with this device. M.2 drives that are PCIe or have a different key position are not compatible with this device. 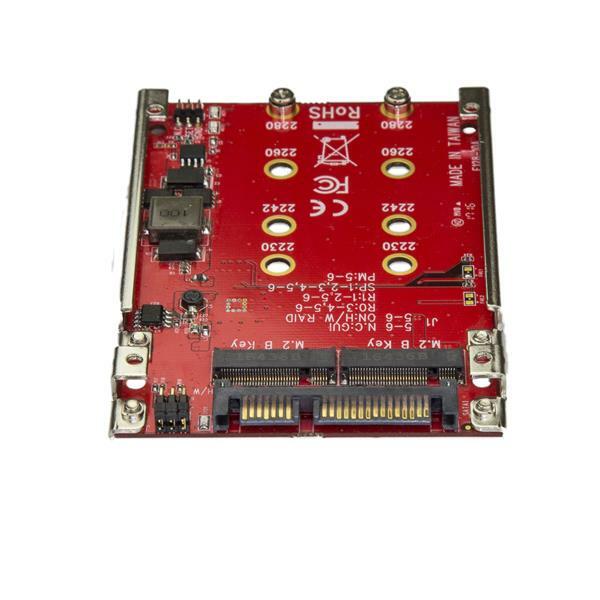 This device can adapt an M.2 SATA drive to standard SATA connections, which is not possible for a PCIe based M.2 drive. The key type refers to the connector type on the M.2 SATA drive. B key can be M.2 PCIe x2 or SATA, so it is important that you check the specifications of the drive to see if it supports SATA. What is RAID and what are the different RAID modes? Note: Not all StarTech.com devices support each of the RAID modes described below. For more information on the RAID modes that your device supports, refer to the manual or the StarTech.com product page. Redundant Array of Independent Disks (RAID) is a virtual disk technology that combines multiple physical drives into one unit. RAID can create redundancy, improve performance, or do both. RAID should not be considered a replacement for backing up your data. If critical data is going onto a RAID array, it should be backed up to another physical drive or logical set of drives. Striping: data is split between multiple disks. Mirroring: data is mirrored between multiple disks. Parity: also referred to as a checksum. Parity is a calculated value used to mathematically rebuild data. Different RAID levels exist for different application requirements. RAID 0 Striped disks Data is split evenly between two or more disks. Large size and the fastest speed. No redundancy. If one or more drives fails, this results in array failure. RAID 1 Mirrored disks Two or more drives have identical data on them. A single drive failure will not result in data loss. Speed and size is limited by the slowest and smallest disk. Only one drive is needed for recovery. RAID 3 Striped set with dedicated parity Data is split evenly between two or more disks, plus a dedicated drive for parity storage. High speeds for sequential read/write operations. Poor performance for multiple simultaneous instructions. A single drive failure will rebuild. RAID 5 Striped disks with distributed parity Data is split evenly between three or more disks. Parity is split between disks. Large size, fast speed, and redundancy. The total array size is reduced by parity. A single drive failure will rebuild. RAID 10 1+0; Striped set of Mirrored Subset Four or more drives are made into two mirrors that are striped. Larger size and higher speed than RAID-1, and more redundancy than RAID-0. No parity. Only one drive in a mirrored set can fail. Big Spanning or Concatenation Data is written on one drive until it is full, and then the next drive(s) until it or they are full. Creates a very large and simple array. Two drives have identical data, plus one drive is used for rebuilding in case of a primary array failure. Seamless operation when one drive fails in a RAID-1 array. Spare drive is not accessible to the user. Only one drive is needed for recovery. If product has an exposed circuit board, do not touch the product under power. If Class 1 Laser Product. Laser radiation is present when the system is open. Wiring terminations should not be made with the product and/or electric lines under power. Product installation and/or mounting should be completed by a certified professional as per the local safety and building code guidelines. Cables (including power and charging cables) should be placed and routed to avoid creating electric, tripping or safety hazards. * Product appearance and specifications are subject to change without notice. © 1985 - 2019 Copyright StarTech.com – All rights reserved.